The mock village of Poble Espanyol is an outdoor open-air architectural museum featuring workshops where visitors can see different types of craftwork taking place. The village is made up of 117 buildings, streets and squares which have been reproduced to scale giving the true feel of a Spanish village. The village was built in 1929 for the Barcelona International Exhibition and some of the replica buildings have now outlived the originals, which were found in villages across Spain. The village is a great attraction for those travelling with children, with fun activities like treasure hunts to take part in, and some fantastic shopping opportunities. More than 30 craft workshops demonstrate the traditional secrets of the different art forms, producing high-quality crafts. The workshops produce handmade dolls and puppets, embroidery, ceramics, glassware, jewellery, baskets, textiles, leather work, soap and much more. Various art exhibitions and studios can be found in the village, including a sculpture garden. The village also showcases Spanish gastronomy, with a wide variety of restaurants dedicated to different Spanish culinary traditions, and plenty of events and activities organised for foodies. 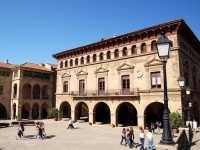 A deservedly popular tourist attraction, Poble Espanyol is a wonderful cultural experience. Opening times: Monday 9am to 8pm; Tuesday, Wednesday, Thursday and Sunday 9am to midnight; Friday 9am to 3am; Saturday 9am to 4am. Admission: €11 (adults); €6,25 (children aged 4 - 12). Concessions available.